Dry your hair. Your hair will curl most effectively if it's dry. If it's soaking wet, you'll just end up damaging your hair and the curling process won't work. It can be just a little bit damp as well. 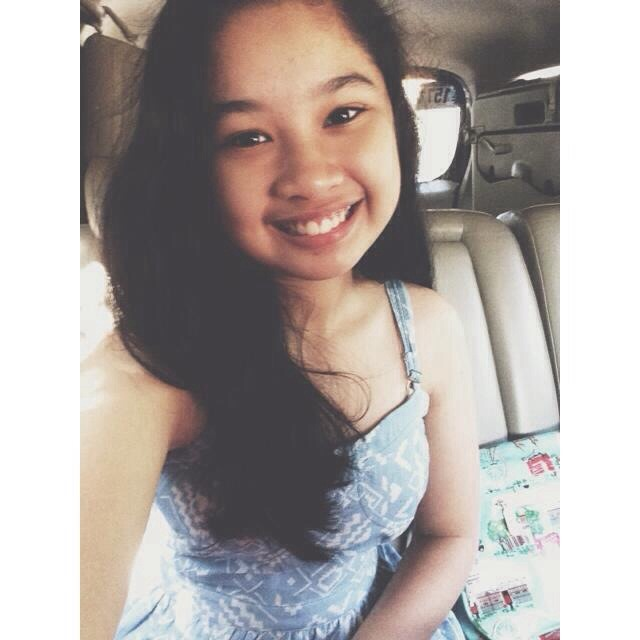 Turn on your flat iron. 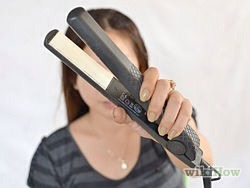 You need an ordinary duel-sided flat iron to curl your hair. A 1 inch (~2.5 cm) iron will be perfect for the job. Just give it a minute or two to fully heat up. If it has settings, pick a setting in the middle so the iron curls your hair the right amount. Section your hair (optional). Sectioning your hair can help you isolate parts of your hair. 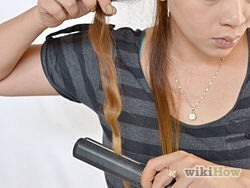 This can make it a bit easier to curl your hair, especially if there's a lot of it, but it can take longer. If you're sectioning your hair, you'll need to clip or pin back the top part of your hair so you can reach the bottom strands first. 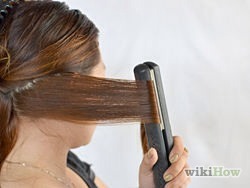 Place 1-2 inches (2.5 - 5 cm) of hair in the iron. 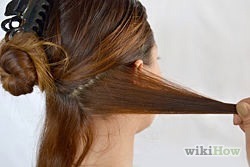 You can start about 3-4 inches (7.6-10.1 cm) down your hair. 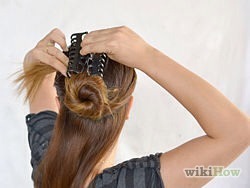 If you curl it from the very top, your hair will look too poofy. Fold the hair backward. 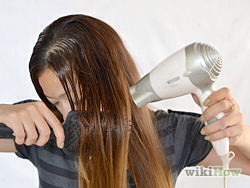 Once the hair is in your iron, just fold it backward, away from your face, and hold the position for a few seconds. Fold the hair forward. 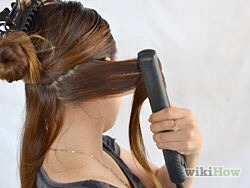 Now, either glide the iron down your hair or just release it and move it down 2-3 inches (5 - 7.6 cm) before you fold it forward, in the opposite direction that you folded it the last time. Continue the process down the strand of hair. Continue moving the iron down and moving it forward and backward until you approach the bottom of the strand. You can leave a 2-3 inches (5 - 7.6 cm) of hair untouched at the bottom to create a natural and flowing look. Continue this process on your remaining strands of hair. Just repeat this process on all of the 1-2 inch (2.5 - 5 cm) strands of your hair until you've created beach waves on all of the strands. If you've sectioned off your hair with a clip or tie, just take more chunks of hair out of the clip until they're all down. To avoid having all of your curls clump together, you can alternate between starting by moving the iron forward first and backward first as you make your way along the strands. That way, each strand will be curled in the opposite direction. You also don't have to start curling each strand in the exact same place. When you reach the outer parts of your hair, you can clip the top part of the hair you're not ironing to the side -- so if you're curling the top-most right strand, you can clip the top left strands to the side of your head so they don't get in the way. Examine your hair. Look at the sides of your head and put up a mirror to the back of your head to make sure that you've evenly curled your hair. 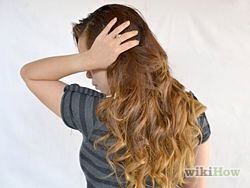 If one side is a lot curlier than the other, just try to make some more beach waves on the other side for balance. Apply hairspray to your locks. This will help you preserve the beach waves for longer.